When you select a writing instrument from our Colour Collection you’ll ignite the mood and spirit of any event or promotion. Go ahead… give the color wheel a spin and find yourself within a wonderful spectrum of options from a subtle champagne to a showy peacock blue. Intent on making a statement? 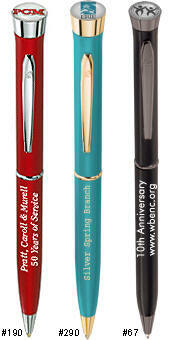 These USA-made metal writing instruments are offered in a color palette that surpasses any in the field! Classic black or grey, ruby red and burgundy, greens, browns, purple, pearl, and our most popular color--dark blue. Choose from a soft, shimmering matte finish, or let our vibrant high-gloss finish infuse depth, intensity and impact to your next program or promotion. Prices shown include your full-color logo in the dome and engraving on the barrel. No run charge for your first line of engraving when you choose one of our ten standard engraving fonts. This single line of engraving can be either a repetitive message or individual names and can include 28 letters and spaces. There is no extra cost for personalization. If your entire order requires two identical lines of repetitive copy, the second line can also be included at no additional charge. A laser logo may be engraved with a one-time programming fee of $30.00. See product details for additional options and information on pricing and artwork.